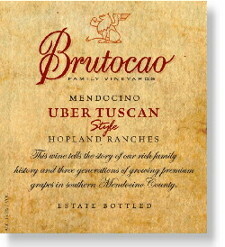 Our eighth release of this "Uber-licous" wine is 70% Sangiovese and 30% Cabernet Sauvignon. Wonderful aromas of strawberry & honey lead the way, followed by succulent flavors of plum, earth & vanilla spice. All wrapped up with traditional Sangiovese acidity. This classic combination will bring out the Italian in any dish. 350 cases produced. WINE CLUB MEMBERS: log-in to save 15% to 20% on this wine.